Reflections, a retrospective, and a (mostly-accurate) list of film screenings at Flor y Canto from 2003-2005. 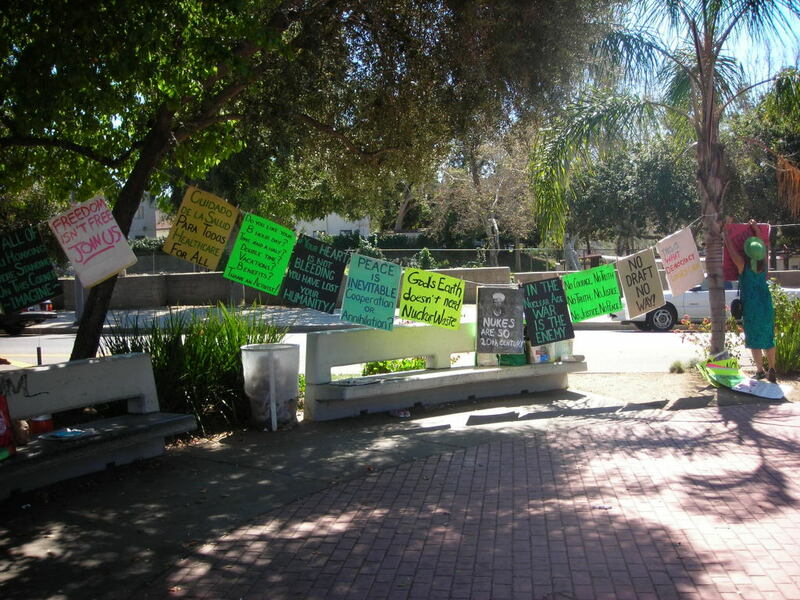 The weekly Eagle Rock peace vigil has passed the five-year mark. 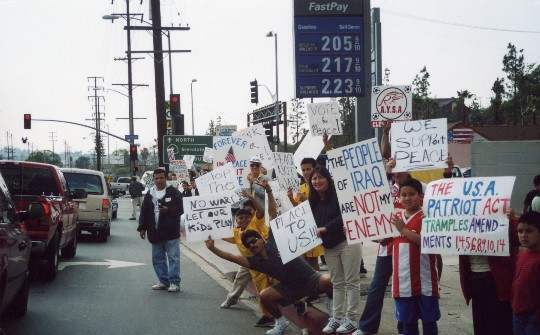 It began in November of 2002 to protest the looming invasion of Iraq. The weekly turnout back then was 60 to 80--it is currently at two-to-four regulars (all "veterans"). We have never missed a Saturday regardless of weather or holidays--except once in December of ’02 to observe Xmas. The passion and momentum from this vigil resulted in much other activism in Northeast L.A., including a second weekly vigil on Sundays in nearby Highland Park (still ongoing); weekly film screenings at Flor y Canto, which occurred for two-and-a-half years (a comprehensive list of our screenings follows this article); donations to local homeless; leafleting at a local high school (now in its fifth year); and environmental endeavors including participation in Arroyo Fest 2003 and a campaign to daylight a stream that today is covered by Sycamore Grove Park. 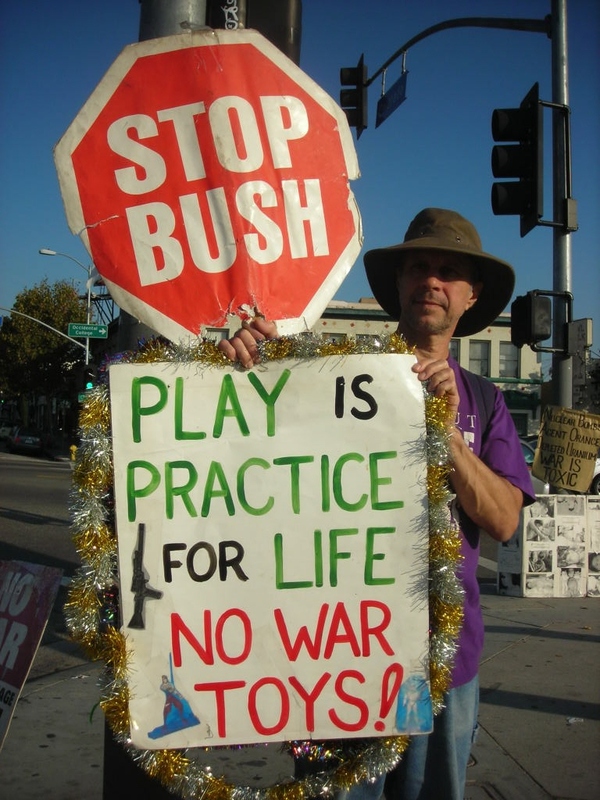 Both vigils have had numerous special events, including annual observations of Labor Day; Hiroshima and Nagasaki Days; and the anniversary of the CIA overthrow of Iran’s last democratically-elected leader, Mohammad Mossadegh. Also, in recent years we have held vigils on Xmas day, New Years Day, and Easter Sunday. Numerous birthdays have been celebrated at the vigils as well. 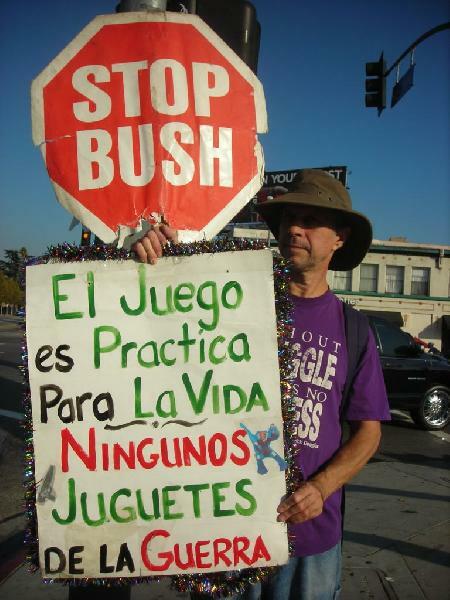 Some of these events have been reported here at LA IndyMedia. 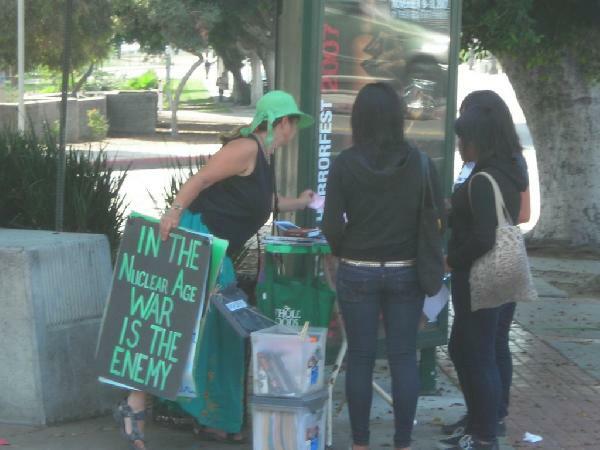 A few examples: Resurrect Peace Easter Vigil (2007), Earth Day Vigil ‘07, Hiroshima/Nagasaki Days ‘07, and Impeachment Day, April 28, ‘07. 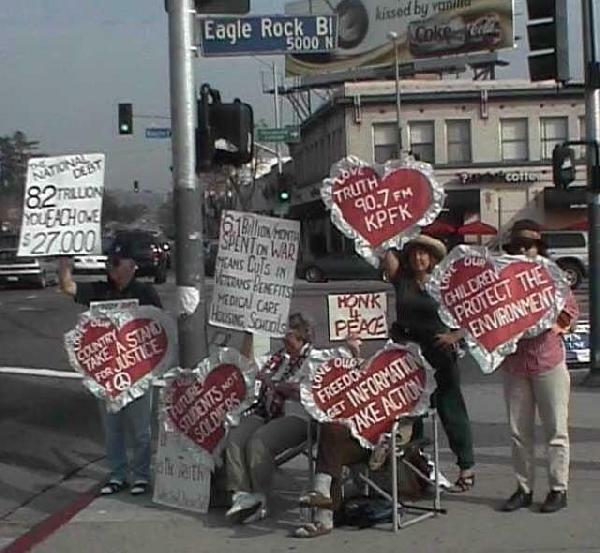 The Eagle Rock Vigil was started by Bob Squires. He recalled the genesis of it back in 2003 in our now-defunct newsletter “Vigilizing Peace through Justice” (aka: “The Vigilizer”). 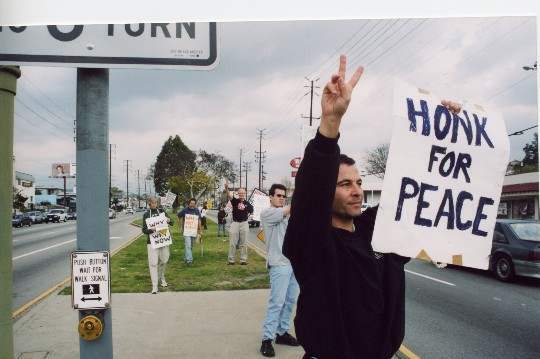 “In early October , I had attended a Neighbors for Peace and Justice protest in Silverlake,” he said. 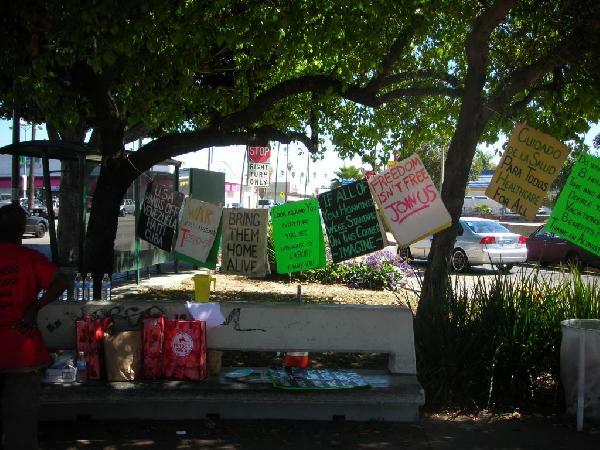 “It seemed to make better sense to me that I protest in my own neighborhood. While I only knew one other activist in Mt. Washington, I suspected that many others in the community felt as I did and that organizing a protest group would not be so difficult. It seemed crucial to get out on the streets to counter the lies upon lies to which the public was being subjected. “We held our first protest on the first weekend in November 2002. The weather was not cooperative for the first few Saturdays. We were rained upon and the lettering on our signs bled. Still, we had a diehard group. We first got to know each other better by going to Swork for coffee after one of our early protests. We started the Neighbors for Peace and Justice Educational Exchange Yahoo group where we post and exchange ideas and valuable information. . . .
Bob since founded Carlotta’s Passion, an art store in Eagle Rock, which hosted several activist events. 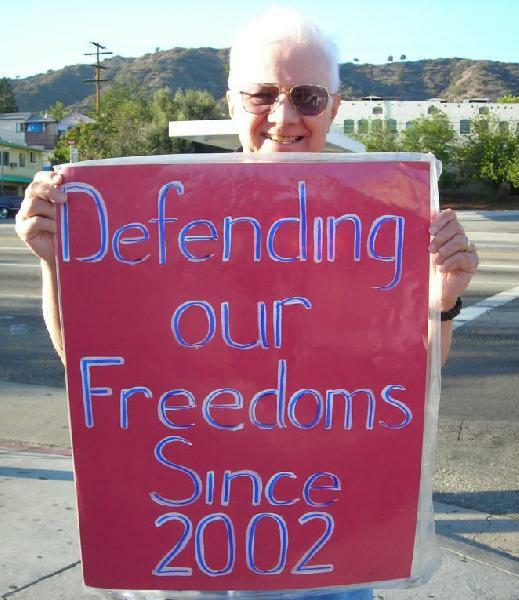 A long-time activist in Los Angeles, Jennifer and her family will soon be moving to another part of the country. They will be greatly missed by many in the activist community. 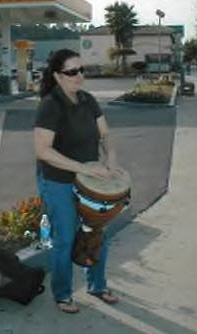 Undoubtedly, Jennifer will continue to be very dynamic in her new community. As was noted earlier, an outgrowth of the vigil was film nights at the bygone community space Flor y Canto. It occurred almost every week for two-and-a-half years. (Eventually, we began taking one night off a month for Critical Mass.) After the screenings had been underway for some time, some of us felt like we were going through college all over again. 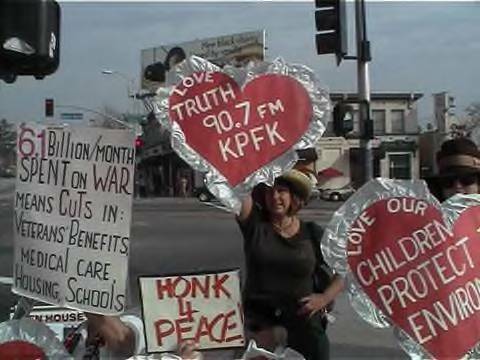 Valentine's Day is observed at the Eagle Rock Peace Vigil. 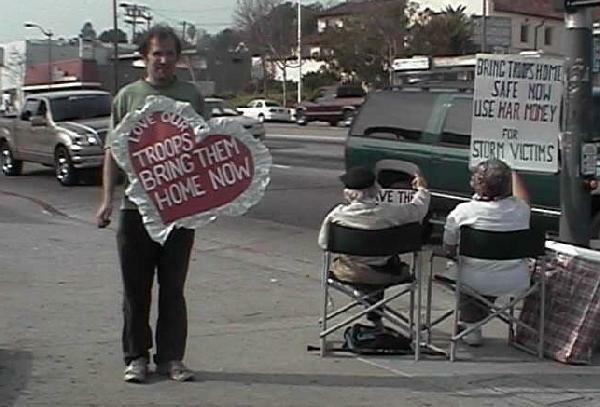 "Love our troops--bring them home." Valentine's Day at the Eagle Rock Peace Vigil. 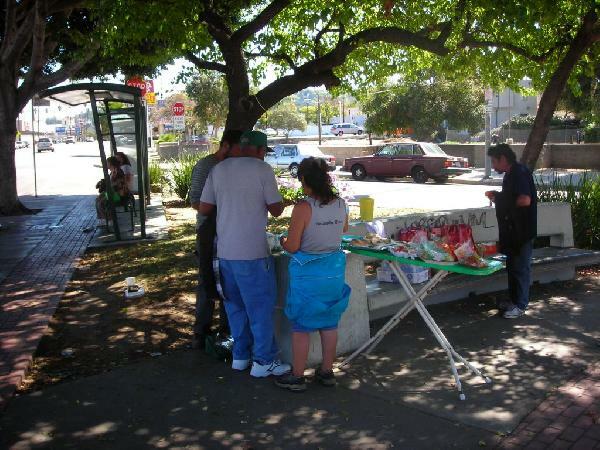 This was at our second location on Eagle Rock Blvd. and Verdugo.